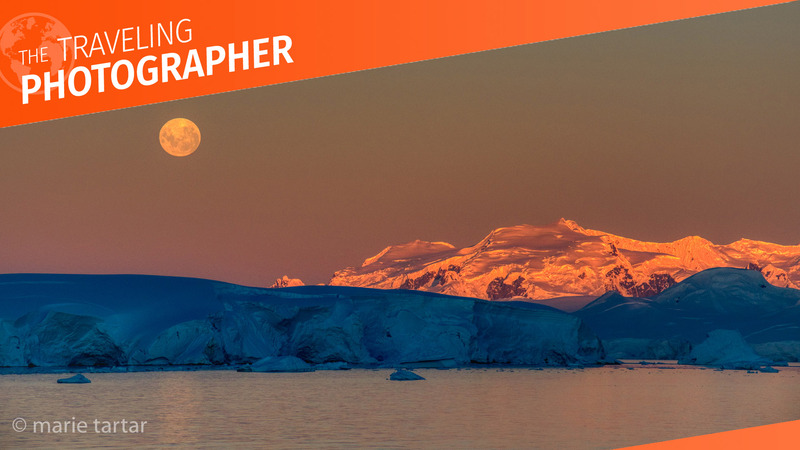 Antarctica is at the end of the world, a destination of extremes of climate, difficult to reach, but so rewarding for the traveling wildlife and landscape photographer. The White Continent is unique in belonging to no country, but being shared as a truly special and unique resource. The first time we went, it was for the wildlife: vast fields of penguins, fur seals and elephant seals, albatrosses. Chinstrap penguins are among the 7 species of penguins which can be seen in Antarctica and sub-Antarctic islands. A gentoo penguin in snow-white Antarctica. Glacier blues and sculptural forms abound in icebergs in Antarctic waters. What took us back again was the ephemeral light and stark splendor of the landscapes. It seduced us, so much that we’re heading there again soon for our third trip. What we’ve learned about the ins and outs of travel to Antarctica may help traveling photographers decide if or how to experience it. It’s expensive. The price will vary with the length of the trip, cabin type and destinations, but range from $10,000 on up, with most trips being in the $14-25,000 range. There are no hotels: Essentially all Antarctic travel is by boat, which functions as a floating hotel. A leopard seal on an ice floe in Antarctica; some excursions will be by Zodiac craft, as seen in the background. The first time we went, 15 years ago, our 3-week trip with Lindblad Expeditions/National Geographic began in Santiago, Chile. We took an included charter flight to the Falkland Islands, where we boarded the boat. From the Falklands, it took two days at sea to reach South Georgia Island. After too few days there, another two days at sea brought us to the Antarctic peninsula. We finished our journey returning by boat to the Falklands and flew back from there. In the cheapest stateroom (opposite the cruise director and from a seasickness point of view, one of the better choices), this trip was under $10,000 each for the nearly three weeks. Trips like these, including the Antarctic peninsula AND South Georgia, seem to be relatively rare these days. Undoubtedly, the length of trip and the expense underpin the tendency these days for trips either to go to the peninsula OR to go to the Falkland Islands and South Georgia. By the time of our second trip, three years ago, another option had emerged: Flying to Antarctica. This sounds irresistible, trading two days at sea for a 2-hour flight to King George Island, where the boat will be waiting. This is a nice option, but there are caveats. On our trip, the second of two identical trips organized by Luminous Landscape, the trip immediately preceding ours never made it to Antarctica. It wasn’t for lack of trying, but the fog and weather windows never permitted the group to land. That’s the exception, but it can happen. As for the 2-hour flight, it may well consume an entire day, as ours did. This isn’t an ordinary commercial flight that leaves at a scheduled hour, weather permitting. In flying to Antarctica, the weather permitting part of the equation dominates. It would be fairer to say the exchange is two days at sea vs. one day accomplishing a 2-hour flight. For the very prone to seasickness, this may still be an attractive option. This trip was about $12,000 each but was only for one week. With travel time, we only had four full days on the peninsula, which was wonderful, but felt a day too short for me. I should also point out that the cost for most of the other passengers in double cabins was $14,000. Sharing a room with a friend in one of the few triples saved us each $2000, just about paying for our follow-up trip the next week to Patagonia. Your home away from home in Antarctica: An expedition ship with an ice-strengthened hull. This is Neko Harbor; the patch of rock and soil without snow is a gentoo penguin colony. This upcoming trip is for three weeks, including the Falklands, South Georgia and the Antarctic peninsula. It is an all-suite boat, starting at $21,500 per person in double cabins and ranging up to over $37,000 for increasingly more sumptuous suites. There are a few triples, so we’re buddying up again with our stalwart travel companion. In a triple, our tariff is $16,000 per person. We booked 1.5 years before and received a 10% early booking discount, bringing our cost per person down to the relative bargain price of $14,400 each, saving Steve and me $10,000 and our friend $5000, as well as the potential pain of roommate potluck (at least he knows what he’s getting into!). After our second trip, we yearned for more time at the peninsula AND a return to South Georgia. Time and money aside, they are both splendid and worthy of the considerable effort required to experience them. In a follow-up post, we’ll compare specific trips geared to photographers as to cost, destinations (how much time and where) and logistics. Close-up encounters with wildlife, like this Weddell seal sprawled on an ice floe, are a major lure of Antarctica. I wish we were going with you! Have a wonderful time and we will look forward to a review of the trip and photos!